I first played Dropmix at PAX about two months ago. 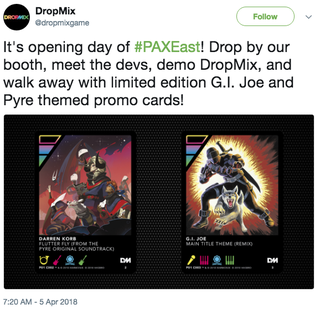 For the unfamiliar- Dropmix is a card-based music game, sort of like if DJ Hero (remember DJ Hero?) and Yu-Gi-Oh! had a baby. You can use the system to just mess around with beats and music, almost like musical solitaire. At PAX, my friend Gabe and I played the game in Party Mode, just throwing cards down to see what the mixes would sound like. The game’s big claim to fame is that any cards you throw down will work together to form a mix- and so far it’s true. I haven’t encountered anything that throws the system for a loop yet. During my time at PAX, I even acquired a couple of special promo cards for the game, despite me not having it at the time. The cards I picked up were the theme song from the G.I. Joe cartoon, and a song from the fantastic game Pyre. I kept the cards but more as souvenirs. The game has a $100 MSRP so I wasn’t exactly planning on picking it up right away. I’ve got a wedding to pay for! Sometime last week, it popped up on Kinja Deals- Amazon was selling the game for half off. I had been hemming and hawing for some time but for that big of a discount I figured, what the hell, let’s give it a shot. At the very least I can feel like a DJ in the comfort of my apartment and I thought my fiancée might like it, too. I purchased the game along with a couple extra playlist packs (because if you’re going to get it- might as well really get it, you know?). It arrived a few days ago and I’ve been putting it through its paces since. Freestyle mode is just fun, even if you aren’t particularly musically inclined and have only a limited knowledge of pop music. What surprised is how in-depth the actual game part of Dropmix is. Myself, my fiancée and another couple played a few rounds of Clash mode today and it was really good fun. There’s strategy, stakes and a great sense of accomplishment when your team wins (our team never won). It’s about controlling the board as much as picking your favorite music, and there are some great Uno-esque reversals that occur when you get into it. Next time we all get together we’ll mess around with the third mode and in the meantime I’ll be watching out for all the remaining playlist packs to go on sale. Because I’ll be damned if I can’t get every single card for this infernal machine. If you’ve got the scratch, I say invest in the game- or do what I did and sweat it out for a few months until a half-off sale. I can tell it’s one of those things that will definitely drop in price around holiday times. It’s going to be a hit with my family, and I want to try it out in various friend groups to see who gravitates towards what kinds of mixes. It’s a weird mix of tech and music and so far, I totally dig it.